If you want to engage in social media, you need to have a social media strategy. If you want to engage in social media to market your company, you need to have a social media marketing strategy. 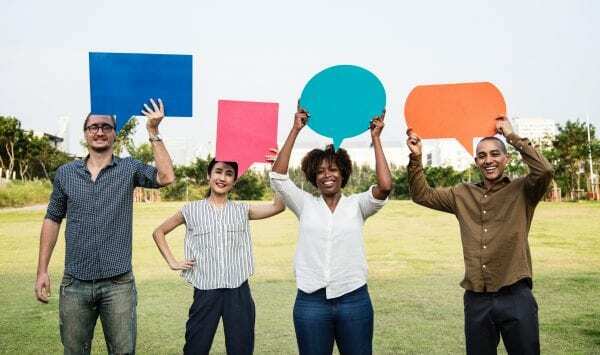 Whether or not you have a formal social media marketing strategy written down or not, here are some social media marketing tips to help make your social media engagement more strategic. The first step towards creating a successful social media marketing strategy is knowing who your target audience is : determining who your product is meant for. How do you go about deciding who your product would appeal to? What your industry deals with : Before diving into who you should be targeting, you need to have a clear understanding of why your product or service exists. What problems does it solve? The answer to this question will help you move on to points #2 and #3 – deciding your audience demographic and audience type. Audience Demographics (age, gender, location etc) : Your product will sit well with certain segments of the population, and may not be very relevant to other segments. For example, if you’re an e-commerce store that sells make-up, you’d want to focus your efforts on reaching out to women, say between the ages of 16 and 50. Check out this article to know what specific demographics you can target. Type of audience : Once you know what your industry deals with, this step should be relatively easy. You need to figure out what type of audience will benefit the most from your product. Bloggers, Working professionals, Individual consumers? Or if you’re looking at a larger scale then SMB’s, Businesses and Brands? After you’ve narrowed that down, the next step is to decide what social channels you should focus on. According to Dreamgrow stats there were close to 2.80 billion social media users in 2017, and this is only bound to increase with time. So social media is a highly relevant platform when it comes to spreading brand awareness or engaging your customers. But the question is what platforms should you be promoting on? It may seem like being active on all of them is a good idea, since this will broaden your reach and help spread the word. But that’s far from the truth. Being present on every social platform will make it harder to manage all of them effectively and you’ll find yourself in a Jack of all trades, master of none situation. Now that you’ve decided who you should be targeting and where you should be promoting your product, you can start working on creating content for your social media marketing strategy. This is one of the most powerful social media marketing tips because content truly is the currency of social media marketing. The type of content you create depends on the social accounts you’re posting to. Posts perform differently on different social profiles, so it makes sense to tailor content specific to each social profile. For example, posting quotes on Instagram is a good way to garner engagement, but doing the same on Facebook may not guarantee similar reach. To make it easier for you guys to prepare content based on social profiles, I’ve put together a checklist on what type of content and character length works best for each corresponding social channel. This is based on information curated from Buffer’s ‘Complete guide to optimizing your social content’. To create infographics, we use both Venngage and Visme. We find they have interactive, and easy-to-use templates for every occasion! In theory, posting content to social media seems simple enough. You design a post, and upload it online every few hours to engage your customers. But how do you know when to post? And if you have to keep posting throughout the day, how do you do so without having to login and out of each social profile and manually uploading posts? More importantly – How do you decrease the time spent on social media, but make sure you still drive traffic to your website? The answer : A social media marketing tool. 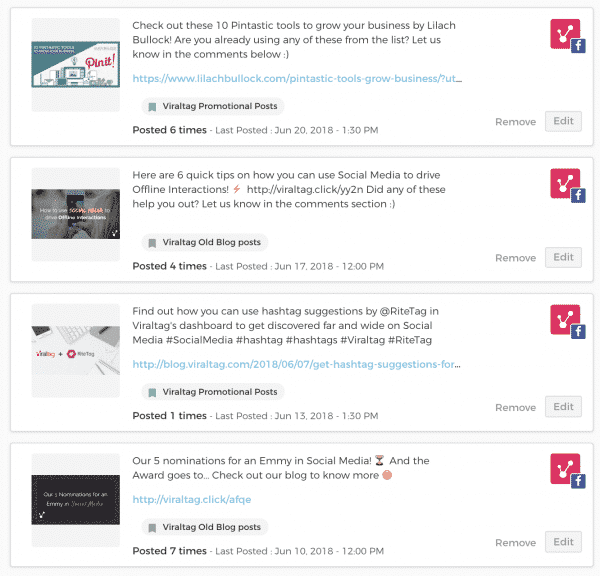 Tools like Viraltag, Buffer and Hootsuite make it easier to curate, manage and schedule content to social media from a single dashboard, effectively saving you up to 5-6 hours each week! 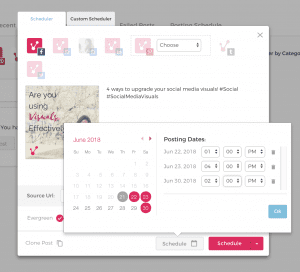 You can schedule content for weeks in advance, and the tool will automatically send those posts out to social media at the designated time. So all you have to do, is make sure you have enough posts lined up in your content queue. You can also recycle your old posts to make sure you never run out of content to post. Repurposing your old content is a good way to make sure that all your followers – old and new get to see your posts. This way you get maximum mileage out of your best performing posts, and increase traffic to your website, as your content gets more reach. 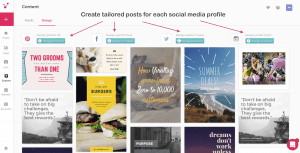 You can create a personalized time table for each social profile you want to post to. Connecting and networking with influencers in your niche is probably one of the most effective ways to get your company noticed and spread brand awareness. If you’ve got an influencer endorsing you or talking about your product/service, word is going to spread, and it’s going to spread fast! This is because influencers have already built a firm relationship with their followers. When they talk about a product, their audience knows that the product is worth trying out because they trust the influencer’s judgement. So when you have this confidence on your side, you’ve struck gold. Step #1 is figuring out who influencers in your industry are. You can use tools like Buzzsumo and NinjaOutreach to do a keyword search and determine who your key influencers are. Linkedin : If you’re marketing a B2B product, LinkedIn is an essential platform you should be connecting with your influencers on. Send the influencers you’ve selected a connection request, with a personalised message about how you know them, and what you like about their work. Follow their LinkedIn page, and share their posts as well. Facebook : Engage with influencers on Facebook. It’s a brilliant way to get in front of a target audience, and reach both the B2B and the B2C community. Search for the influencer’s FB page, follow it, and comment on/like their posts. It’s also a good idea to share their content, and tag them in it – it’s a great opportunity to be noticed. Twitter : Twitter is probably the best social media platform to interact directly with influencers. Follow their Twitter handle, retweet content they post, and make sure you mention them when you share their content, so they get a notification and you get noticed. Instagram : It goes without say – to get an influencer’s attention, follow their feed, and like and comment on their posts. Additionally, reposting their posts with apps like Repost is a good way to make them notice your efforts. After you’ve followed and networked with them on social media, send them a personalized email Pitch. Here’s three case studies of influencer outreach done right! Make sure you still interact with the influencers on social media, to maintain the your relationship, so it doesn’t look like you cut ties with them once they agreed to start promoting your product. A robust social media marketing strategy doesn’t involve rocket science, but it does require planning, research, and most of all discipline to stick to the plan until you see results. Should you not see the results you desire, go back and do this exercise again to see where you might have miscalculated the assumptions in your social media marketing strategy! This is one template that you can use over and over again for your social media marketing strategy. Were there any important pieces of a social media marketing strategy that we missed? Any other social media marketing tips that you think should be added to this list? Please comment below and let us know! Neal you run really informative blog. 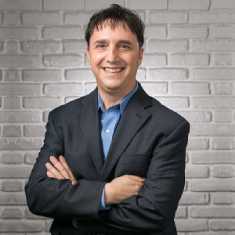 I would like to ask Neal, Is there any way to find my niche based influencers without utilizing tools like Buzzsumo. I am asking this question because sometimes small companies do not have access to many tools so what is your suggestion when somebody does not has access to these online influencers finding tools. Hi Rachel, tools save you time. You can spend lots of time searching for influencers and analyzing their influence. Or you can pay a little money to get access to tools that can do this for you very quickly. The choice to make is yours. really enjoyed your post the tips has been useful for the business. Great and educational post. For people that don`t know how to make the best out of social media for their businesses this is really helpful. Very informative post. Social media will give the loads of opportunities to grow your business and helps you attract the targeted audiences (both B2B and B2C). Sharing more infographic content on social media will give more visibility. Thanks for such a nice article…. Great article Neal and some amazing stats. Social media has great potential to boost both B2B and B2C businesses. It is true that it has provided a platform to target and engage wider audiences. Your tips for social media marketing will surely be helpful for entrepreneurs seeking to expand their horizon. However, I would like to add that companies should aim at creating new strategies and contents with latest technologies such as ‘white board’ to enhance their reach and provide creative content to their audience. Thanks for chiming in Martin! Thanks Stephen – couldn’t agree with you more! Interesting post, Neal. Social media has the potential to dramatically grow your business if used correctly. Your tips to social media success are amazing. I love the idea of creating valuable content, as it will help you attract the right audience. However, you need to also pinpoint the type of content your target market loves to engage with and create more of those. And as you mentioned, time is a crucial element to your success, which simply means that you must figure out when your target market are online to post your articles. Thanks fir sharing, Neal. I already schedule it for posting! Thanks for the comment Moss! This is more of a back to basics post, but if you aren’t creating valuable content to attract the right audience you are not going to be successful. And because time is limited you MUST strategize on a number of different levels. Keep hustling Moss! You’re absolutely right, Neal. I can’t agree any less. Good job! You’re right, Neal. Time is an essential commodity that must be managed correctly because it is limited. So, having a strategic plan is the only way to success.